With the title taken from the name of a jingoistic German hate poem, Hymn of Hate is the debut short film by Matt Kennard. 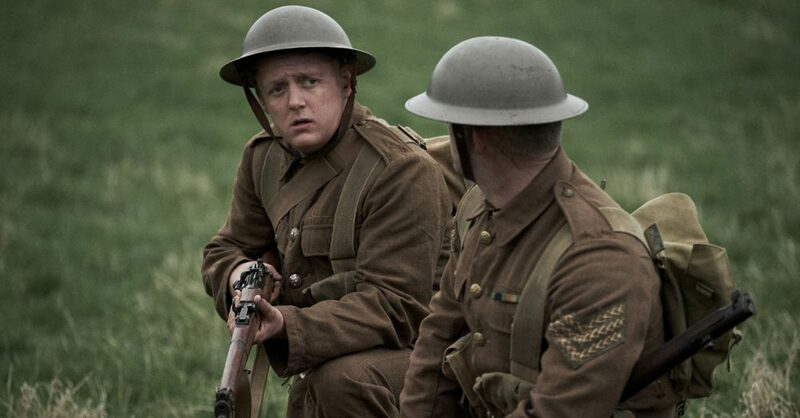 Set in No Man’s Land at The Somme during WWI, the film ‘is a poignant and never more relevant film, made to coincide with the centenary of the end of the Great War’. You can read the full poem, and catch the rest of the synopsis on the Mini Productions site. We caught up with Matt to get underneath the skin of this multi-layered, beautiful and fascinating film. D&CFilm: The title is taken from an Ernst Lissauer poem of the same name. How did you come across it, and why did it inspire you? Matt Kennard: I’d been researching WW1 for a while, intending to write a longer form piece or a series of short stories looking at how, if at all, we’ve changed societally in the past hundred years since the end of The Great War. Looking into various poets, I stumbled across Lissauer and Hymn of Hate, a German poem written during the war designed to stir up a tribal hatred of the English. I’d actually already written the script and unimaginatively titled it ‘No Man’s Land’ but when I read the poem it embodied everything I wanted to discuss in the film – so I nicked it. D&CFilm: There’s been a focus on the First World War lately for obvious reasons. Do issues of that time resonate with now, and what themes do you raise in Hymn of Hate? Matt Kennard: I certainly think these issues from a hundred years ago are as relevant now as they’ve ever been. The film’s themes of propaganda, xenophobia and oppression, were, and are still used as tools by the elite to control the narrative and encourage this nationalistic, tribal and hate-fuelled – us against them – rhetoric that only ever suits their own selfish agenda and further oppresses the poorest people in society. I did, however, want to throw in a touch of light and express that if we, the ‘common folk’, can look past the uniform, ask more questions and embrace our own humanity, then maybe we can finally begin to break the status Quo. D&CFilm: How did you create No Man’s Land and the period, war-torn nature of the film? Matt Kennard: I was keen to show No Man’s Land in a different light to the usual, lunar landscaped, shell-hole ridden, barbed-wired hell. I’d read so much about the early days at The Somme and the ‘rolling-green fields’ and birdsong that the soldiers wrote about at length in letters home. After looking at loads of places up and down the country we found a field behind a friends place in Hertfordshire that belonged to a farm and really felt like that vast, open space and neutral ground, far away from either sides trenches that I wanted the soldiers to meet in. It was full of sheep when we first found it, but sadly for them their fate was sealed and the farmer let us have it. After that the aesthetic was down to Natalie O’Connor who designed the film and Sarah Tapscott who id worked with before did a splendid job on costumes. My cinematographer Mike Doxford was keen to shoot on 16mm, but considering this was my first shoot it scared me somewhat and we ended on a compromise of these beautiful old anamorphic lenses which I think added a really great texture to the picture. D&CFilm: You’ve managed to bag a renown cast – how did you get the actors to sign on for Hymn of Hate? Matt Kennard: My wife Laura was instrumental in the casting. I knew Russell [Tovey] through her as they’d played boyfriend and girlfriend together in ITV comedy, The Job Lot and I got her to send him the script. I was delighted when he said he was up for doing it and after that success I again got Laura to approach Tomo [Thomas Turgoose], who she’d also worked with, and is a fellow Grimberian! Thankfully he was up for it too. I run in the same running team (for Bloodwise) as Andy Knott and he and Russell are old pals from The History Boys. Once I’d checked he was comfortable with a German accent and he was up for it, that was a no brainer too. I count myself extremely lucky to have had such incredible actors on my first film. D&CFilm: You tried to find a predominantly female crew for the film. Why was that important and did you manage it? Matt Kennard: I’m a straight, white man: I wrote a film about three straight white men and I wanted my friend and longtime collaborator Mike Doxford (also white male) as my DP. I was fully aware, although I felt strongly this was a story that deserved to be told and had as much merit as any other story about oppression that might be told this year, that I still needed and wanted to address, in some small way, the key talent imbalance when crewing up. I was able to secure the services of the wonderful April Kelley and Sara Huxley at Mini Productions (if you want a film producing, use these guys if you can get em). Tellingly, I think I could’ve crewed this film three times over with male contacts I have but sadly, not so much with women. I did have a few contacts in the more traditionally female driven departments but it was trickier when it came to roles like A.D’s, sound, lighting and camera. April and Sara had more contacts than me when it came to women in film and we almost reached a 65/35 women to men ratio in the end and the majority of key roles behind the camera were filled with female talent but it wasn’t easy and we were only a short film, remember. We have little money and it’s a kick-bollock scramble just to get people on board and get the thing done. I’m fully aware I’m not changing the world by the way, I guess I just wanted to start as I mean to go on and be aware of how diverse the team is that I’m working with going forward. I also love working with women. It was a calm and considered set. D&CFilm: Hymn of Hate is your directorial debut – what was the transition from acting like and what have you got planned next? Matt Kennard: I started acting 25 years ago and until 2011 it was all I’d known. I’d kept just about busy enough but I wasn’t really working on stuff that satisfied me creatively so I started writing. I’d never really thought about directing but whilst writing HoH I saw a really clear vision for it and thought, why not? Give it a go. I failed at a few funding attempts and ended up on Indiegogo. We raised a solid amount from some incredible people and got the thing done. I’m writing a few TV shows currently that may or may not make it to air and I’m taking the themes of HoH into a more current setting, looking at modern warfare and the arms trade, specifically the Al Yamamah deal and the huge, international ramifications. It’s blowing my mind! D&CFilm: Many thanks for your time, Matt!